How to check my website is down or not for everyone worldwide? < How to check my website is down or not for everyone worldwide? You might have received emails and messages from the audience that your website is down. The web hosting company might provide a website uptime history, but it doesn’t display downtime. The servers might work in your region, but the servers do not respond in specific countries, and your website is down in unknown countries. There are several ways to check website availability, and they are indeed accurate in web monitoring. Of course, several third-party developers have created tools to check website down today. In case, if you have spotted a website suffering from downtime, you can alert them and check website owner details for an email address. How to check if you’re website is down? I have already mentioned that servers might respond to locally, but they are down in specific countries. In short, administrators have to focus on the international level to ensure that readers or clients can access the site globally. The website uptime history does not list down in-depth information on the downtime. Experts in the field utilize several methods to test the server capability, downtimes, and in-depth analysis of the non-responsive servers. We are going to show the readers/administrators regarding website availability test tools. One of the popular sites I have come across a few years back in “Down For Every One or Just Me” site. Administrators can utilize the advanced algorithm based tool to identify the culprit. The website servers specifically designed for web monitoring. The developers spent a lot of time to make it a user-friendly and functional tool for the masses. Go to the official site from here. Enter the URL of your website in the empty field and click on “or just me?” to view final results. We have tested a website, and the portal doesn’t seem to suffer downtime. The results confirm that the browser contains a cache or saved form data, and clean it to make it work. The biggest CON I have noticed regarding the website availability test tool that it doesn’t display advanced metrics. A website is down is enough to create a panic in the administrator's heart. The new audience might get disappointed from non-working pages and posts. Administrators can lose hundreds of leads and sales due to downtime. Host Tracker is a metric based site equipped with advanced features. 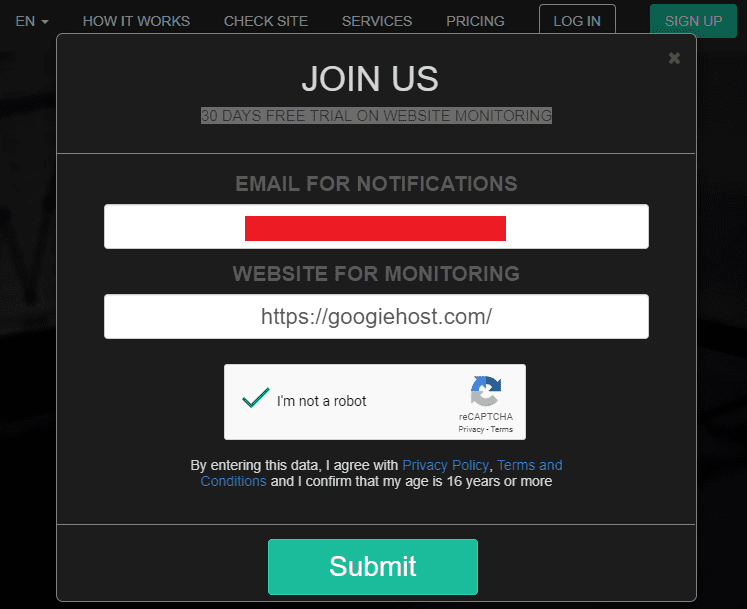 The company demands the users to create a free account to start testing the site. The web monitoring service is offering advanced features for a price, and it doesn’t disappoint the experts at all. Go to the official Host Tracker, and hit the email address, and then enter the website URL. Click on “start monitoring” to begin the website availability test. Complete the verification process, and hit on submit. An email sent on the registered address, and copy & paste the given password. Also, create a new password to protect the account from theft. Enter the site URL, Location of the server, and hit on CHECK to enable web monitoring. The advanced tool begins to check, whether your website is down or not. In a few moments, the advanced metrics are on your screen. The Host Tracker company 30-days trial period is enough to test all functions and its worth. Site 24/7 is an advanced tool for every web application such as check website status tool, servers testing tool, web application status, and more. It is a premium service available for professional companies, and it is a magnificent tool for administrators as well. The 30-days free trial adds greater value to the new customers. The users have to create a new account with Site 24/7 and start using the services without adding a credit card. The company did not put a unique effort to avoid signing up the process and using the tools. The user-friendly interface of Site 24/7 does not create confusion, so try trial version now. InCloak also was known as Hide My Name VPN Company, which is a Virtual Private Network service seller. Proxy is a golden technique to check website status, and it is an excellent tool for manual verification of website is down. A VPN comes with hundreds of servers locations in different countries. The administrators can focus on the multiple locations and servers to confirm the website is down or not. Of course, the services are not 100% free, but there is a free version available for the new customers. The first method covers quick web monitoring and the second method covers website availability test with in-depth information. We have shown basic level to advanced level website is down verification tools multi-million digital marketing firm using.